Do you have a default meal for those nights when you’re short on time and knee deep in hunger? Something that doesn’t take too long to make, requires zero brain power, and is better (and cheaper) than takeout food. Is that even possible?! My default option for a meal like this is constantly evolving — I’ll usually make it once or twice per week for a couple months on end and then it will morph into a new default. I’ll start posting some of these simple meals because I think they’re just as valuable as the more elaborate recipes on the site. They’re not meant to be pretty or complex — just some quick, efficient meals that also happen to immensely satisfying. 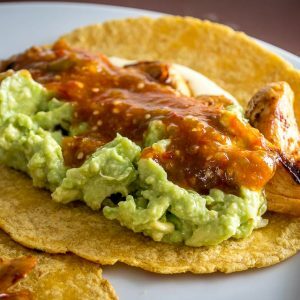 These Easy Chicken Tacos are my current default and I’ve been leaning on them for the past month or so. They’re quick, filling, and far superior to any takeout Mexican in my area. But don’t worry about reproducing them teaspoon perfect. I’ll list measurements in the recipe box below but I certainly don’t measure anything when making them — broad strokes will get you there as long as you are making the homemade Salsa. Yes, as usual, it’s the Salsa that’s the key to this on-the-fly meal. And in this case, it’s a freshly made Tomatillo-Chipotle Salsa. This is a wicked Salsa to have in your repertoire so consider giving it a go if you’re new to it. Sure, you can pan roast these or stick them under the broiler, but the oven is the most hands-off method and that works perfectly for this meal. 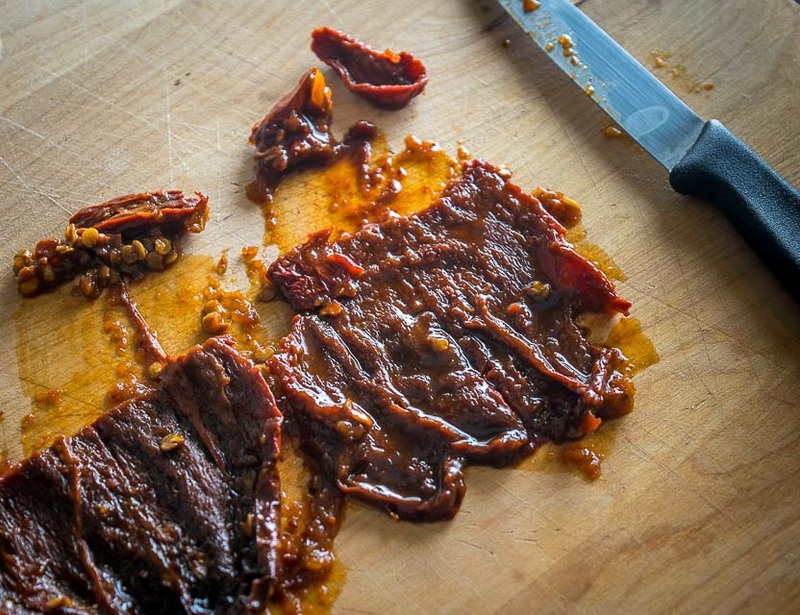 You’ll also need two chipotles in adobo for the Salsa. If you’ve been following along you may recognize these from the homemade chipotles post a few weeks ago. I usually cut off the stems and scrape out the seeds, but don’t worry about getting rid of every last seed. Add these to a blender along with 2 peeled garlic cloves where they will wait patiently for the tomatillos to finish roasting. We’ll use the majority of this for the chicken and save a couple tablespoons for the Guacamole. Add most of the onion to a saute pan along with a glug of oil over medium heat. But more importantly, don’t sweat the chicken seasoning too much. Feel free to use some of my ideas but it isn’t crucial to these tacos. Why? You’ll know when you taste the Salsa! I usually add the seasoning to a bowl along with a glug of oil and the bite-sized chicken pieces, combining well. Once the onion starts to sizzle we’ll add the chicken and form a single layer with it. I don’t bother cooking the onion much before adding the chicken. Once the onion is sizzling it usually means the pan is hot enough and the onion will finish cooking as the chicken cooks. Let the first side of the chicken cook nearly all the way through, 5-8 minutes. Once most of the pink is gone we’ll flip it and cook the second side for a couple minutes to finish it. Once the chicken goes in the pan I usually add the tortillas and cheese to a dry skillet over medium heat. Crisping up the tortillas is one of the keys to these tacos, so no skimping! They are infinitely better when the tortillas are warm and crispy. So how do you know when the tortillas are ready? Take a peek underneath — when they have golden brown spots forming they are usually in the prime crispy zone. As the chicken cooks and the tortillas crisp up you’ll have time to whip up the Guacamole. 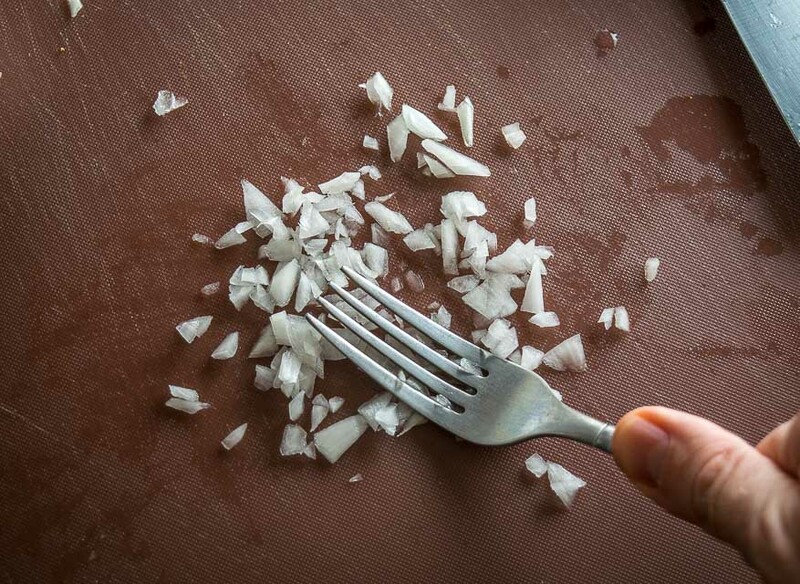 Finely chop the leftover bit of onion and smoosh it with the back of a fork. This will mimic a molcajete and release some additional flavor that will infuse into the Guac. The last step is to take the roasted tomatillos out of the oven and blend them with the chipotles and garlic. This is a delightful 3-ingredient Salsa that is absolutely loaded with flavor. If it doesn’t combine readily in the blender simply add a splash of water. And I usually wait until the absolute last moment to combine this Salsa in the blender. Why? I like it best when it’s served warm on these tacos. If you leave the tomatillos in the oven until the last second it will make the Salsa nice and warm. Perfect! The Guac will be cold, and adding cold Salsa on top of that is no bueno. But adding warm Salsa to the cold Guac gives these tacos a delightful texture. If using leftover homemade Salsa I will usually warm it up in a saucepan before serving it. 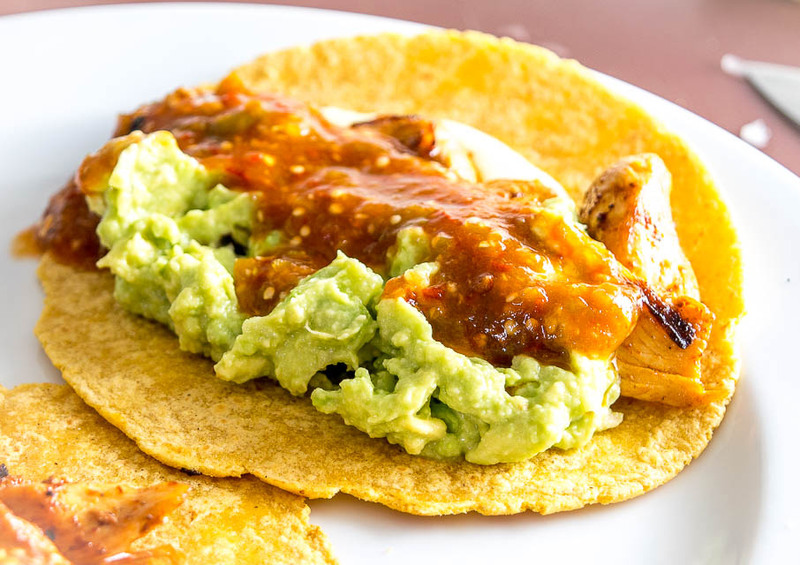 Okay, load up your crispy tortillas with chicken, Guac, and plenty of the warm Salsa. 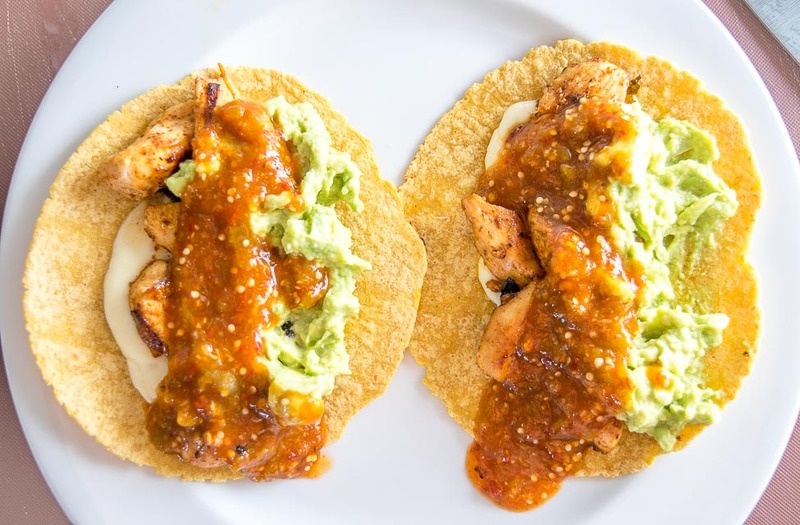 When the tortillas are warm and crispy, and the cheese is melted, and the chicken is seasoned, and the Salsa is warm and goopy — well, you get the idea. They taste good. And they can be made in 20-25 minutes once you get familiar with the elements. Perfect for those nights when some home cooking is in the cards, but without too much cooking. 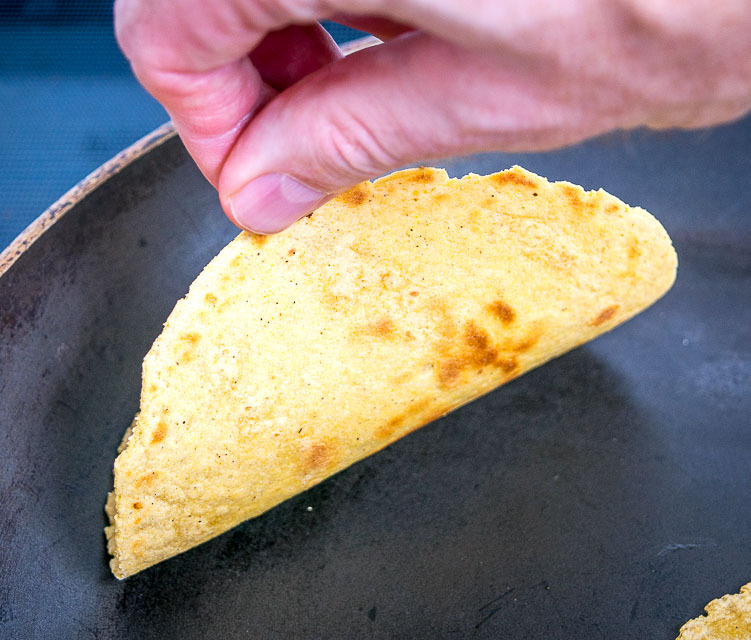 Crisping up the tortillas in a dry skillet (and melting the cheese) is a gamechanger! 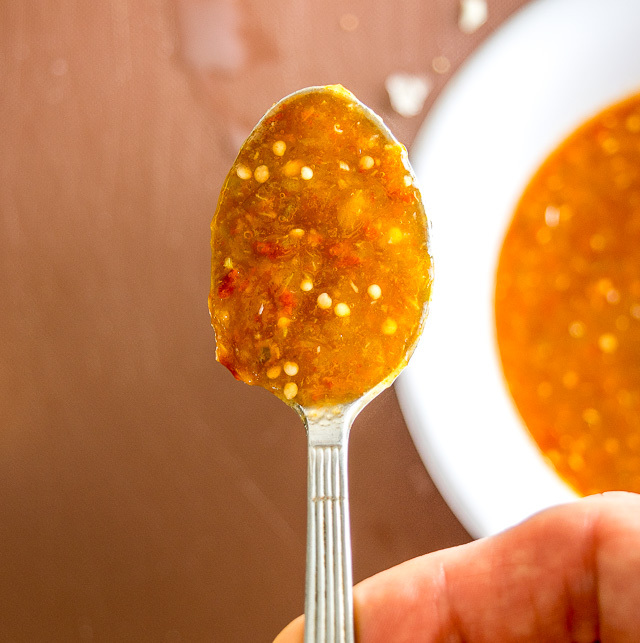 Serving the Salsa warm is an instant upgrade that’s worth taking advantage of. 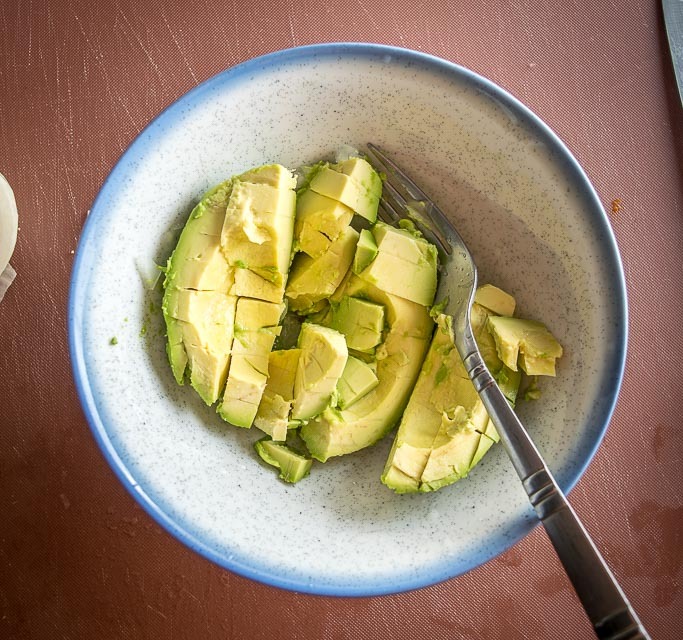 The simple Guac can be made in a matter of minutes and tastes surprisingly complete. 1/4 teaspoon salt is a good starting point to season a single chicken breast. A single chicken breast will make 4 loaded tacos. Salsa Verde and Salsa Roja are also good options for a quick homemade Salsa. Okay, I hope these Easy Chicken Tacos have given you a few new ideas for a quick, no-thinking-involved meal. See you in a couple months for the next entry in this series. By then I’ll probably have settled on a new default for an old reliable meal…..and you will too! Lately this is my default no-thinking-involved meal, it can be made in 20-25 minutes. But don't skimp on making the homemade Salsa as that is the key to everything! Husk and rinse the tomatillos, cutting out the stems. 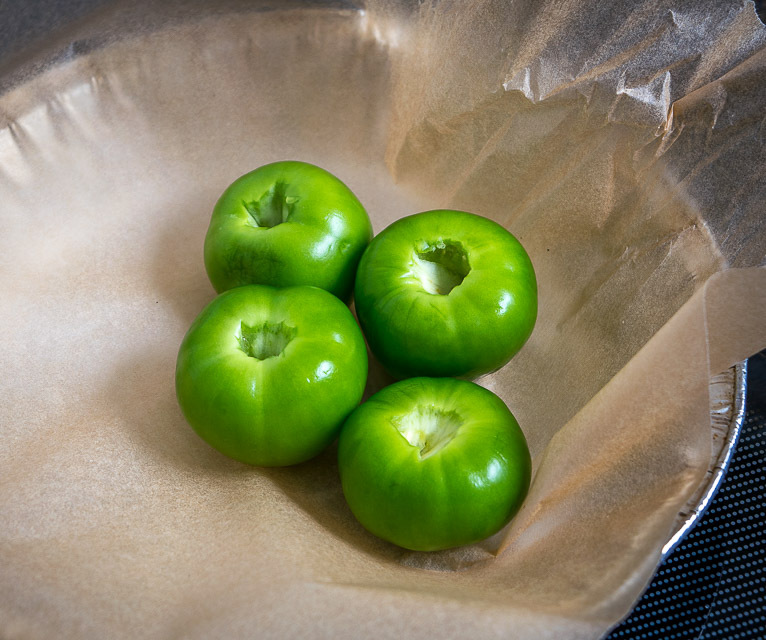 Roast the tomatillos in the oven at 400F until you need them (15 minutes or so). 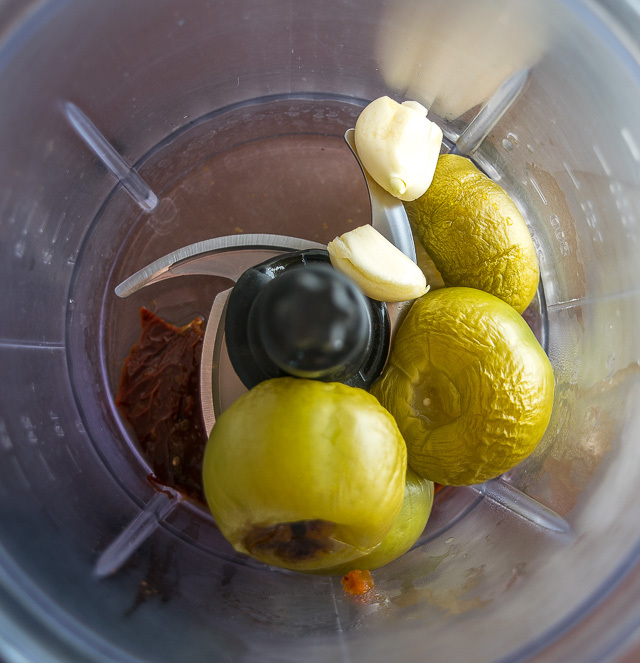 Add two chipotles in adobo and 2 peeled garlic cloves to a blender. I usually de-stem and de-seed the chipotles. 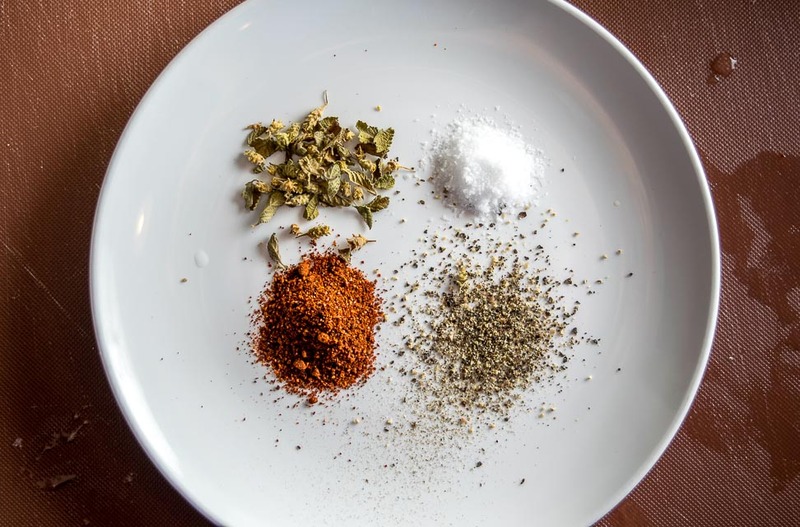 For the chicken, add the seasoning ingredients to a bowl: 1/2 teaspoon chili powder, 1/2 teaspoon Mexican oregano, 1/4 teaspoon salt, freshly cracked black pepper, and a dollop of oil. Chop up the chicken breast into bite-sized pieces and combine well with the seasoning. 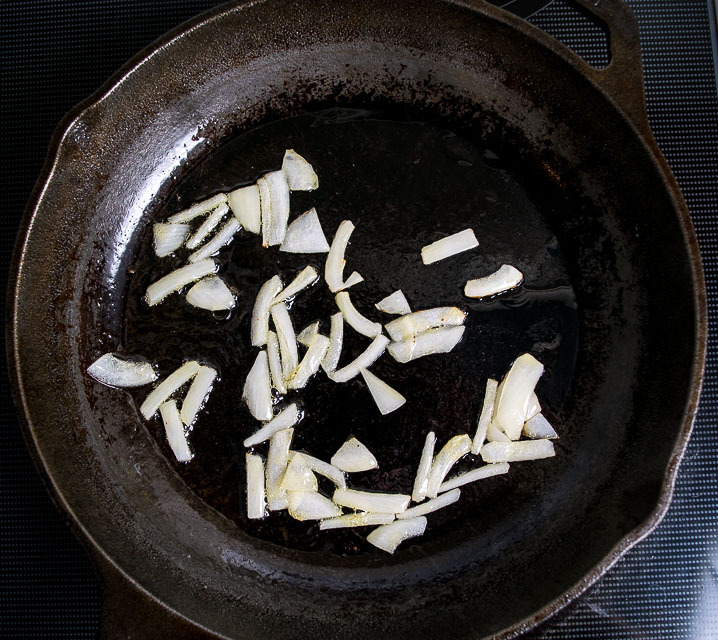 Roughly chop 1/2 onion and add most of it to a skillet over medium heat along with a dollop of oil. 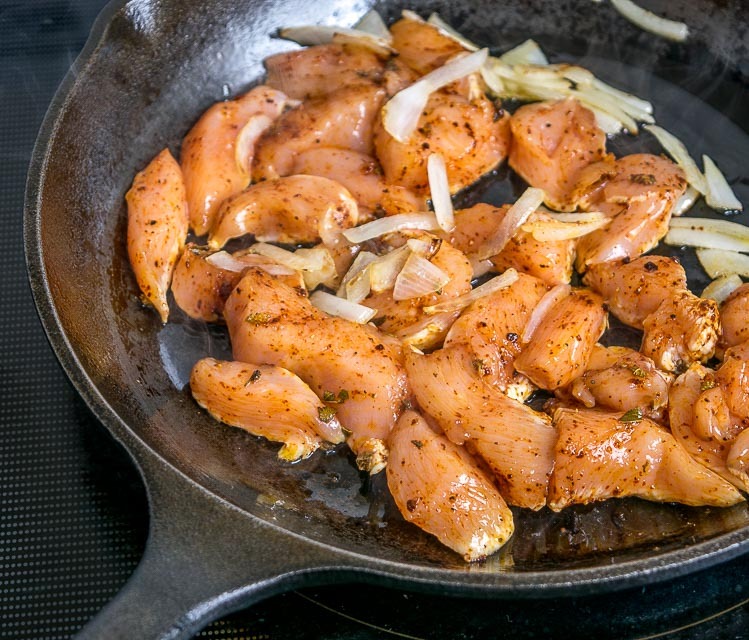 Once the onion is sizzling add the seasoned chicken pieces and form a single layer with them. Saute until the first side is nearly cooked through (5-8 minutes), then flip and cook the second side for a couple minutes to finish them. 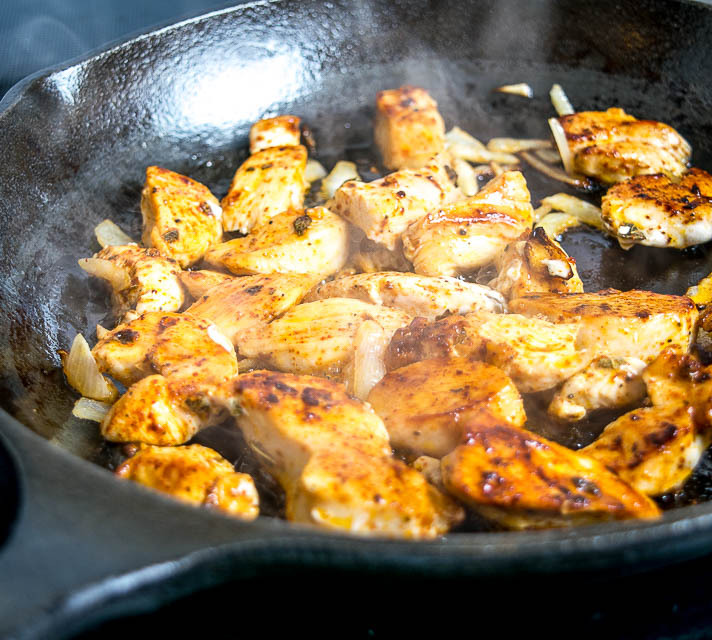 When the chicken goes on I usually add the tortillas to a dry skillet over medium heat along with some slices of cheese. Cook the tortillas until crispy and light brown spots are forming on the bottom. As the chicken cooks you'll have time to make the Guac. 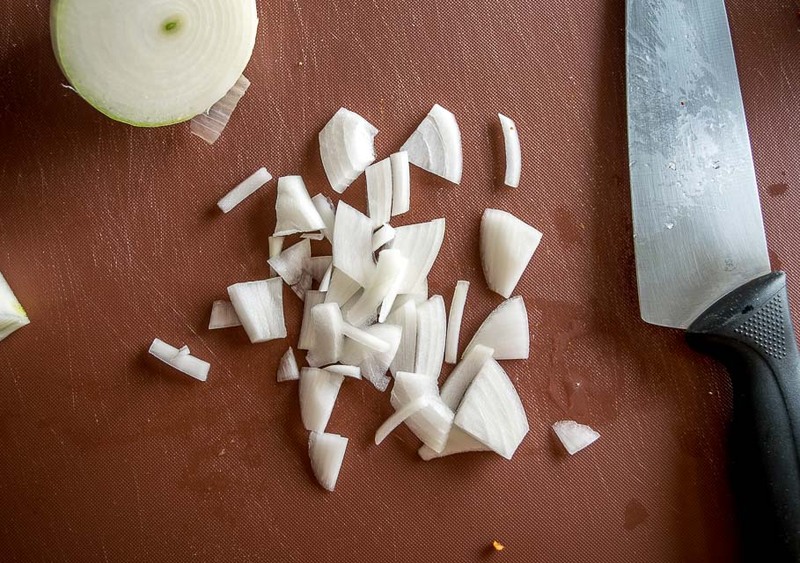 Finely chop 2-3 tablespoons of onion. Use the back of a fork to smoosh the onion until it turns translucent. Add the onion to a bowl along with the flesh of one avocado, 1/4 teaspoon of salt, and the juice of a half lime. Mush and mix well. Taste for seasoning, adding more salt and lime juice if necessary. Just before serving, add the roasted tomatillos to the blender and combine well with the chipotles and garlic. If it won't combine readily you can add a splash of water to it. Give it a taste and confirm that the Salsa is warm (and that you like the heat level, adding more chipotle if you want). If the Salsa cools down before serving I will usually warm it up in a saucepan. Each crispy, cheesy tortilla gets chicken, Guac, and plenty of Salsa. Buen Provecho! 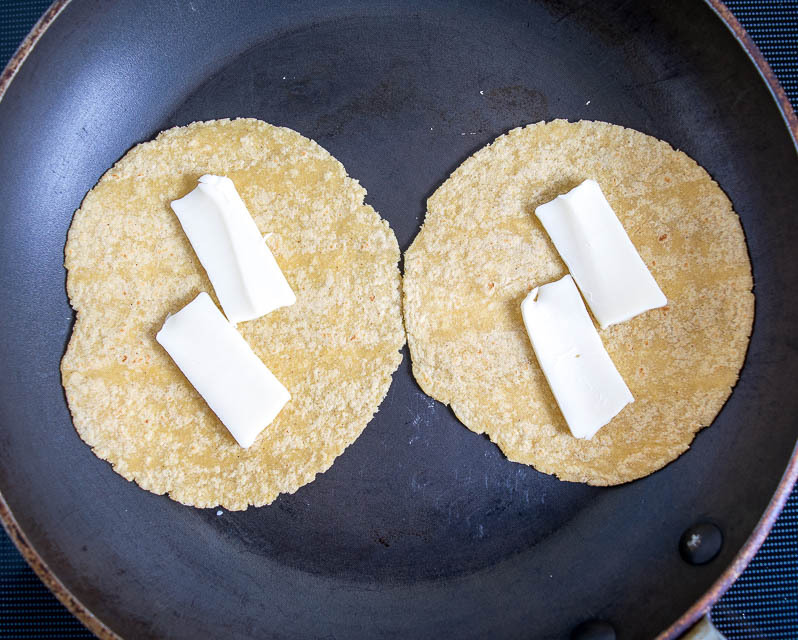 I usually crisp up the tortillas (and melt the cheese) 2-3 at a time. This ensures you're always eating a warm, crispy taco. Even if you're making a larger batch for a group it's still worth doing this and it's a good way to involve family and friends. Keep the skillet on medium and add 2-3 tortillas at a time (along with the cheese). 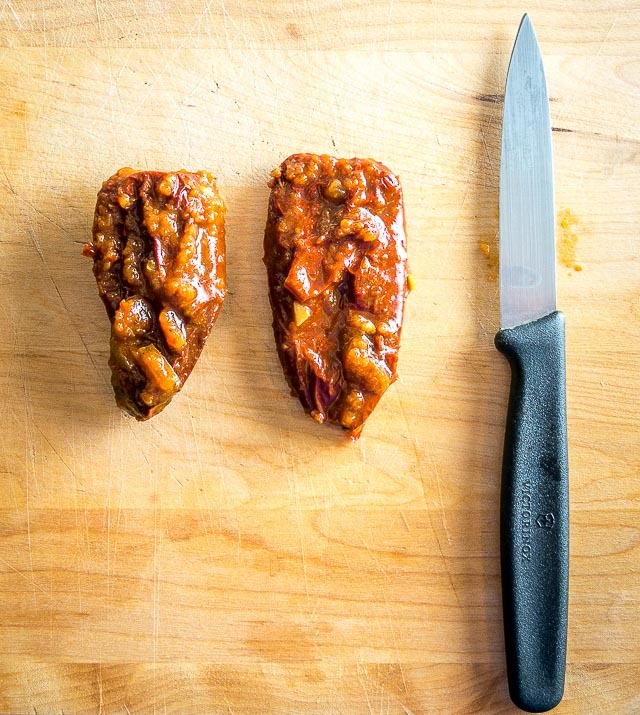 Crisp them up for a couple minutes and bring them to the table so peeps can build the rest of their tacos with them. These tacos taste best when the Salsa is warm! Want to see our latest recipe? 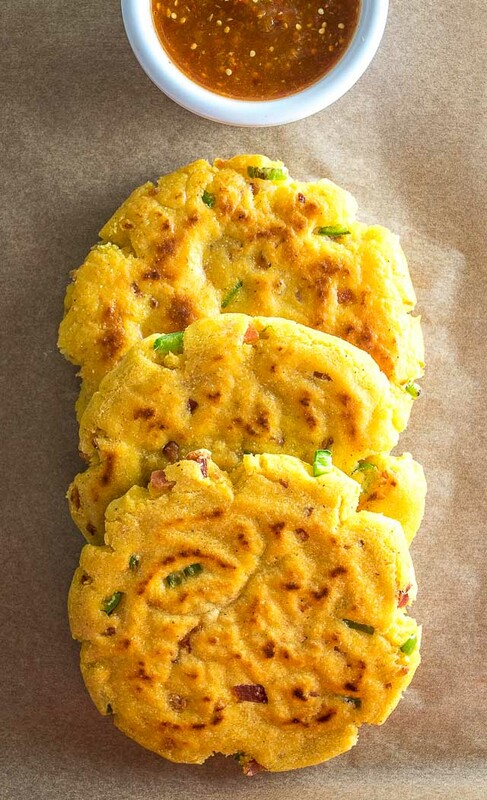 It’s these Bacon Serrano Gorditas.